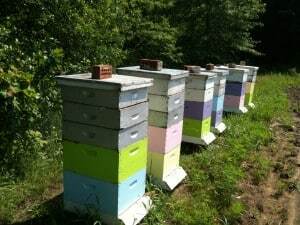 Here in Michigan, while a bit too wet for many crops, conditions are near optimal for the bees. The high moisture levels have ensured that the White Dutch Clover and other bloom that opened in late May have continued to bloom and provide ample nectar to foraging bees. We added our honey supers (the shallow hive bodies on top of the two deep hive bodies the bees use for brood rearing) in late May and the bees have made substantial progress in filling them with a beautiful light amber honey, mostly from the white Dutch clover that laces the cow pastures and yards around our apiary in Hudsonville. This year even our new colonies started in early April from packages are producing surplus honey. 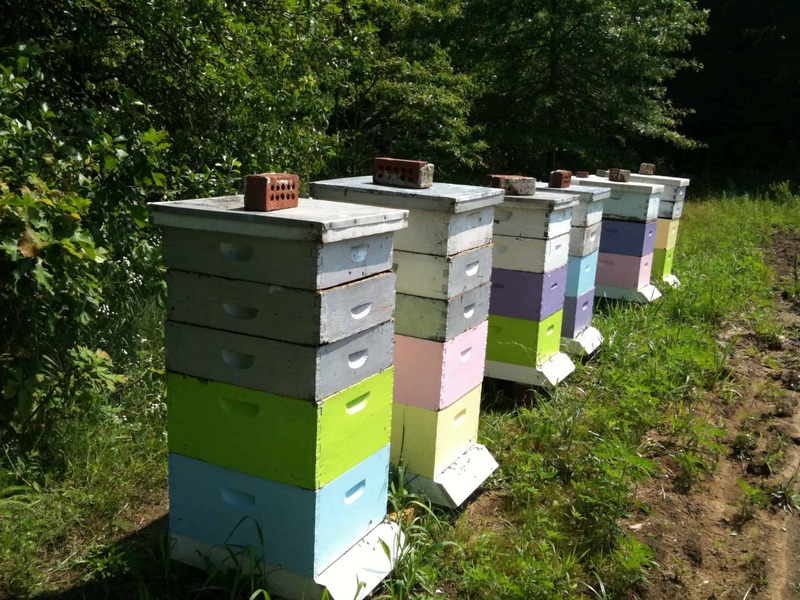 In our area, the bees produce the best honey (at least form the human perspective!) from the Dutch clover in late Spring / early Summer, as well as the starthistle (also known as “knapweed”) which normally begins blooming sometime in July. We are already seeing starthistle blooming along the highways in certain areas, and expect that shortly all the untilled land in this area will take on a nice light purple hue as this highly productive honey plant begins its annual bloom. Supered colonies in our apiary. 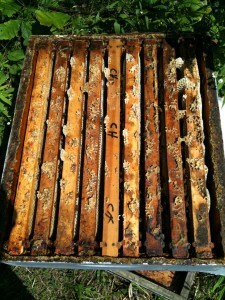 "Whitening of the combs" in a honey super, as nectar sources become plentiful for the bees to forage. You can tell when nectar sources become plentiful when you open a hive. 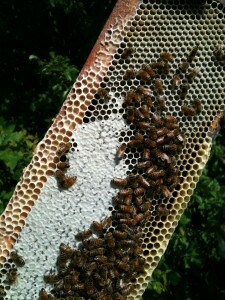 As you look down on the frames, you’ll see what beekeepers refer to as the “whitening of the combs”. 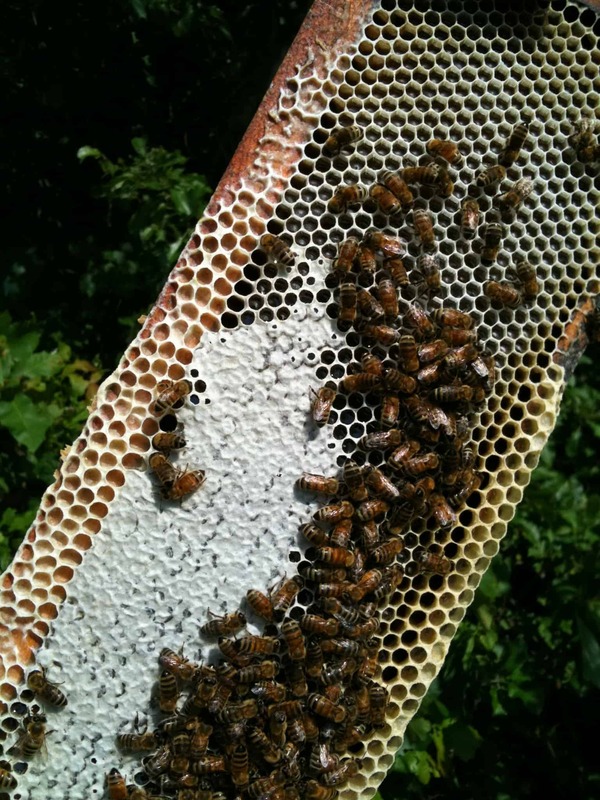 As the bees begin to fill the combs with honey they will draw the combs out so they extend beyond the frames, and this new white comb is visible without actually removing the comb. In the honey supers intended for extraction, we place 9 frames per super rather than the standard 10 frames. This makes it much easier to “uncap” the sealed honey prior to extraction. This time of the year is “prime time” for the bees and their beekeeper. It’s a wonderful time of the year to visit the apiary and marvel at the amazing productivity of the bees as they exhaustively gather nectar and pollen. Exhaustively is actually and understatement, as the worker bee literally works herself to death in around 6 weeks this time of the year. However, to compensate for that ongoing loss, the incoming nectar and pollen also stimulate brood rearing in the colony, so that the queen (assuming she’s healthy) will be laying at her peak of over an estimated 1.5k eggs daily in the brood combs. Partially capped frame of honey. We did have a problem with one of the Russian queens in the packages we started earlier this Spring. She started out laying worker brood in a smaller softball sized pattern (not unusual in early Spring before there is not much bloom/pollen) but by late May she was laying only drone (male) brood. This seemed to indicate she was poorly mated, and would be unable to rear a normal healthy colony. Happily, we get our package bees via the wonderful people at Walter T. Kelley Company down in Kentucky, and upon notifying them, they promptly forwarded us a replacement queen which is now happily helping her newly adopted colony catch up with the others. The faulty queen was also put to good use, as her remnants are now part of the bug collection our niece is putting together for her 4H project.